This last Saturday afternoon I took a fall cooking class at a local bakery here in Orange County, the Blackmarket Bakery in Irvine. I also found out yesterday that they were just voted best bakery in Orange County by OC Weekly. A super big Congrats to them, they deserve it! 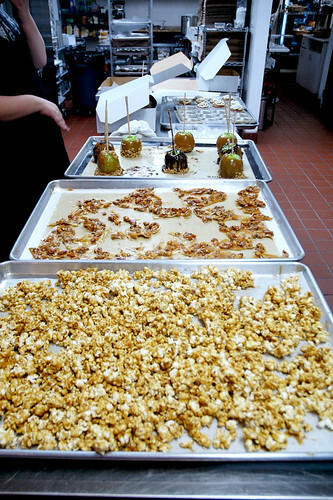 Our team decided that we wanted to tackle the difficult bread, the caramel corn and the spiced truffles. Every team tried different combinations and all in all everything on the list got made and some things got made twice (caramel corn and brittle). We all got to taste everything and everyone took home a big box of goodies to enjoy later. 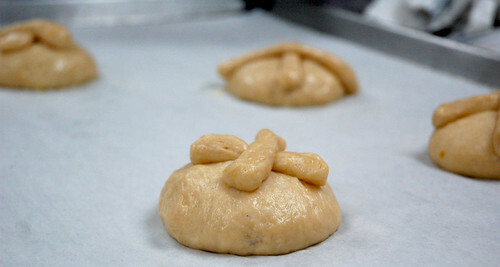 This is the Day of the Dead Bread after we shaped it and got it ready for its final rise before baking. The finished product is at the top of the page. 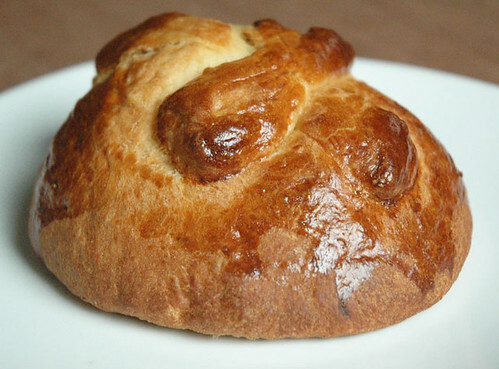 I had never made a yeast bread with butter like this one, and it was a very slippery soft dough to work with. The ingredient quantities were very specific and everything had to be weighed out precisely. The bread had a sweet buttery taste with a subtle orange flavoring from orange zest. Due to the lack of time we didn’t get to let it rise as many times as the recipe called for, so I think I might like to try this bread again and make sure to do all the required rises. 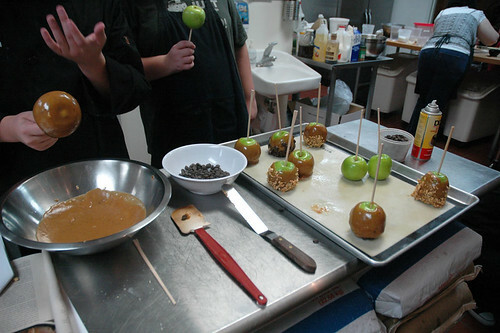 One of the teams made the caramel for the caramel apples and then everyone in the class got to dip and decorate their own apple. Chris loves caramel apples, especially with chopped peanuts, so this is the one that I made to bring home to him. 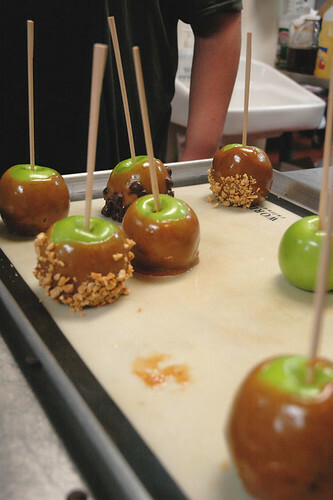 He ate it that same night and said it was one of the best caramel apples he has ever had! He loved that the caramel was so soft. 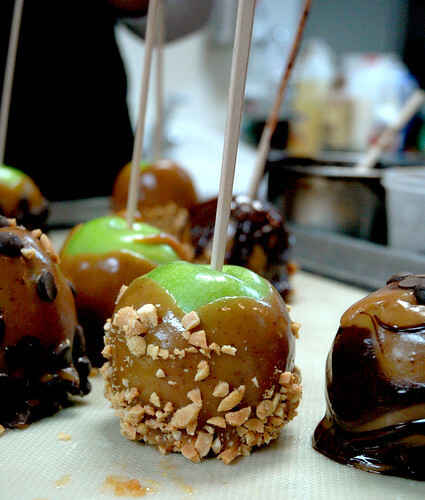 This one had not been refrigerated at all, so I am not sure if that would make the caramel hard like other caramel apples he has had. 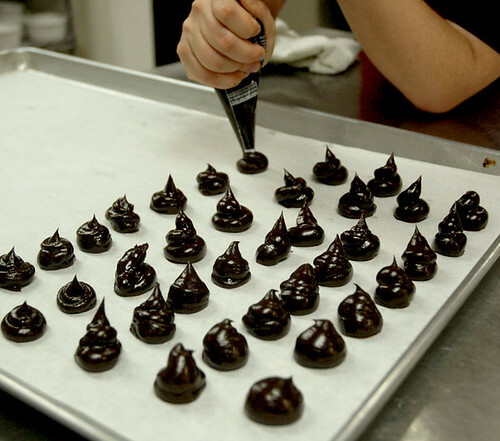 Here we are piping out the finished ganache for the truffles. Once pipped, they chilled in the fridge for a few minutes, then we rolled them in coca powder mixed with cayenne pepper and they were done. These were creamy and delicious, and the spice of the pepper with the dark chocolate is a wonderful combination. We got to decorate some shortbread and gingerbread cookies with royal icing. 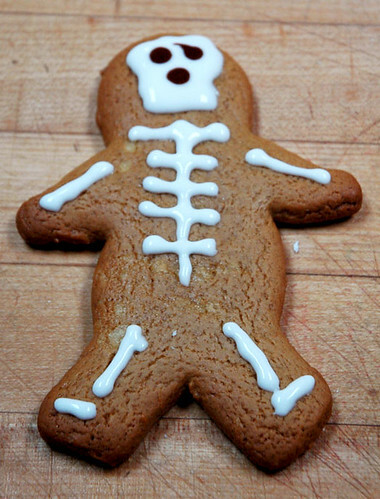 Rachel showed us how to do these cute and festive Halloween Gingerbread Skeleton men, this was my finished product. This is quite a few of the goodies that we made and got to package to take home. The caramel corn was DELICIOUS and I plan to make some this week and post the recipe very soon. I had so much fun, it was the perfect cold and rainy day to spend in doors in a kitchen baking all kinds of yummy goodies with fun people. I can’t wait to take another class there! Amazingly awesome! That class sounds like so much FUN! Can I eat all of that, now??! Thanks Hal! I had a wonderful time and wish you could have been there with me to enjoy all the yummy fun!